Nik Chmiel is Professor of Psychology and Head of Department, Department of Psychology & Counselling at the University of Chichester, UK. 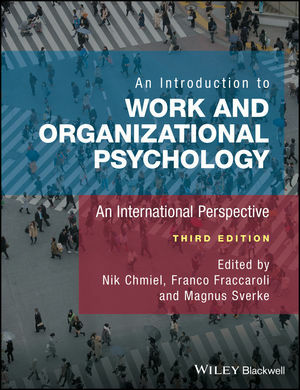 He is the past president of the European Association of Work and Organizational Psychology (EAWOP) from 2003-2007. He is on the policy committee for the British Psychological Society publication The Psychologist, and an associate editor of the European Journal of Work and Organizational Psychology. His research interests focus on psychology in the workplace, and include the psychology of safety at work, job stress and work engagement. Franco Fraccaroli is the Professor of Work & Organizational Psychology, Department of Psychology & Cognitive Science at the University of Trento, Italy. He is president of the Alliance of Organizational Psychology and past president of the European Association of Work and Organizational Psychology (EAWOP). His research interests include the older worker in organizations, meanings and social representations of work, careers in organizations, psychology of work time, and validation tools in work and organizational psychology. Magnus Sverke is Professor and Chair of the Division of Work and Organizational Psychology, Department of Psychology at the Stockholm University, Sweden. He is also Extraordinary Professor at North-West University, South Africa. His research interests include organizational change and its effects on employees, downsizing and job insecurity, labor market flexibility and employment contracts, employee attitudes and well-being, work climate and employee motivation, union member attitudes and behavior, as well as career development.